The bail for the release of the accused in the case is fixed at NO BAIL RECOMMENDED FOR EACH ACCUSED which may be furnished by the said accused either by depositing the amount thereof with the nearest collector of internal revenue, or provincial, or city or municipal treasurer who should transmit the same to this Court or by furnishing a personal bail subscribed by two or more solvent sureties whose solvency may be shown by their land tax receipts and certificate of title free from encumbrances and determined by any Judge of Regional Trial Court, Circuit Judge, City or Municipal Judge who may accept the bail and transmit the same to this court. The peace officer making the arrest are hereby authorized to discharge from custody the accused after furnishing bail in the manner herein--above indicated, which must be stated in return hereof. Pasay City, Metro Manila, November 18, 2011. Sec. 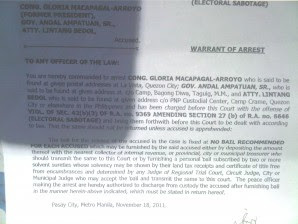 (4) Execution of Warrant. The Head of the Office to whom the warrant of arrest has been delivered for execution shall cause the warrant to be executed within ten (10) days from receipt hereof. With ten (10) days after the expiration of such period, shall make the return to the judge who issued the warrant and, in case of hi failure to execute the same, shall state the reasons thereof. Hear Mass in Quiapo Online!